Is Chagas disease the ‘new AIDS’? A Triatome bug feasts on human blood: This type of beetle is a carrier of Chagas disease, an illness that has infected 8 million people worldwide, and recently has sickened more than 300,000 Americans. The parasite has a long incubation period, similar to HIV/AIDS, causing the disease to come in two phases: acute and severe. During the acute phase, victims can experience fever, general illness or malaise, or swelling of the eyes. Afterward the disease goes into remission, often for several years, until victims one day begin experiencing constipation and digestive problems. 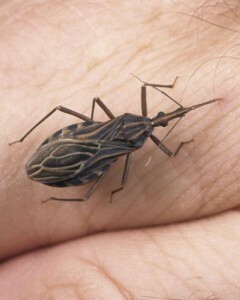 This is the severe stage, eventually causing a large number of the Chagas disease sufferers to develop enlarged hearts or intestines, which can burst, causing sudden death. The disease can also be spread from human-to-human, especially through blood transfusions, if the blood isn’t tested for the parasite. If caught early enough, Chagas disease can be curable, or at least containable, though a typical treatment takes three months of harsh medication. The main problem, say researchers, is that the long incubation period makes symptoms difficult to detect.